Khenchen Pema Sherab Rinpoche was born in 1936, at Riphu, a place in Dege Jomda, in the Kham Province of Tibet. When he was eight, he studied reading and writing Tibetan from his uncle Lama Choesang while herding cattle. At fourteen, he went to Lhasa and studied under masters and scholars of all schools of Tibetan Buddhism. In 1953, Shechen Kongtrul Rinpoche bestowed novice vows upon him. In 1959, he fled from Tibet to India. He met H.H. Dilgo Khyentse Rinpoche, from whom he received most of his teachings. On various occasions, he has received many teachings and oral transmission from H.H. Dudjom Rinpoche and H.H. 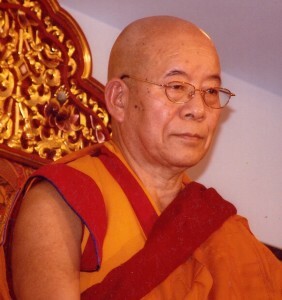 Penor Rinpoche. In 1968, His Holiness Penor Rinpoche invited him to come Namdroling to teach the Dharma. Thought at that time, the Ngagyur Nyingma Institute was not established, Khenchen spent a few years teaching the traditional common and uncommon fields of study to small monks of the monastery. Since the establishment of the Institute in 1978 until nowadays, Khenchen Pema Sherab Rinpoche has been teaching in this institute out of compassion and kindness to the students. The teachings that he has dispensed include the common traditional sciences of Tibetan grammar, spelling and poetry. Among the uncommon traditional studies, he has taught many teachings that illustrate the distinct view, meditation, conduct, and fruition of the Nyingma Lineage. For the benefit of future generations, he has composed many books on Buddhist philosophy. All in all, he has taken the responsibility to manage the institute with great compassion to this day. Hence his kindness is unfathomable.